The Online Executive MBA is built with five essential pillars of essential learning: Executive Readiness, Strategic Thinking, Fresh Perspective, Values, and Connection. The program is designed for working professionals, so students can work full-time and still complete the program in as little as 18 months. Students must earn 42 credits to complete the program. The 42-credit Howard Executive Online MBA covers learning essentials of finance, accounting, management, statistics, communications, ethics, and much more, all completely online. The program begins with a three-week “MBA Fundamentals” orientation and culminates with a Strategic Management Capstone centered around concepts involving corporate strategy. There are currently 27 students enrolled in the Howard Online Executive MBA program, 96.3 percent of which are underrepresented U.S. minority-status citizens. The class is currently 44.4 percent female. Tuition for the Online Executive MBA is currently $65,900. Including the $75 application fee and $500 enrollment fee, the total cost of the program comes to $66,475.20. Students are expected to spend around $800 for books per semester. There are two fellowships, 12 teaching assistantships, and seven research assistantships available. Federal grants, Stafford loans, scholarship programs, and employer-assisted payment options are all available. 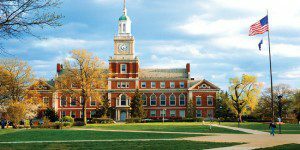 Students applying for the Howard University Online Executive MBA must have at least seven years of professional work experience and five-or-more years of management or senior-level experience. Applicants must also provide an undergraduate degree from an accredited institution, resume, a Statement of Interest, three letters of recommendation (one from a current supervisor), and a $75 application fee. The school does not require GMAT scores, but it is recommended. As well, a previous GPA of 3.0 is recommended for applicants, but it is not a requirement. International applicants from non-native English speaking countries must provide proof of English competency, either with TOEFL or IELTS results. Updated applications deadlines have not yet been made available. How Affordable are Baltimore MBA Programs Compared to DC?